Twitter finally starts to get the 'networking' part of 'social networking'. Twitter is a fascinating site. People tend to either love it or hate it. Well over 100M people either love it, or at least are curious about it enough to sign up to see what the fuss is all about. Up until now, it's been a good way to keep up with news in real time, but it has not been very competitive in the "networking" part of social networking. That has now changed. Taking a clue from sites like Facebook and Linked-IN which display mutual contacts among users, Twitter is now showing which followers users have in common ("Who to follow"), as well as Twitter users you may know based on mutual contacts ("You both follow'). Here's how it works. 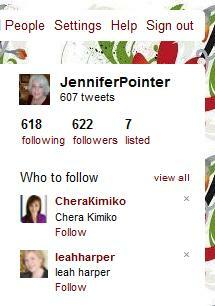 When I visited Chera's profile page, Twitter showed me (at the top, right under her name and photo), links to 13 mutual contacts ("Also followed by"), and in her right sidebar, a list called "You both follow," which if clicked, shows a list of people we both follow. I love this new feature. Up until now, it has been quite difficult to find relevant contacts on Twitter. I usually found mine by following people whose Tweets I liked in other feeds, such as hashtags, groups or lists. This is much easier, less time-consuming, more intuitive, and makes more sense.